The award-winning Don Vito pizza. Joe and Ada DeRienzo opened the original DeRienzo's Pizza and Pub (1267 Jungermann Road, 636-317-1034) on Virginia Avenue in south city in 1961. 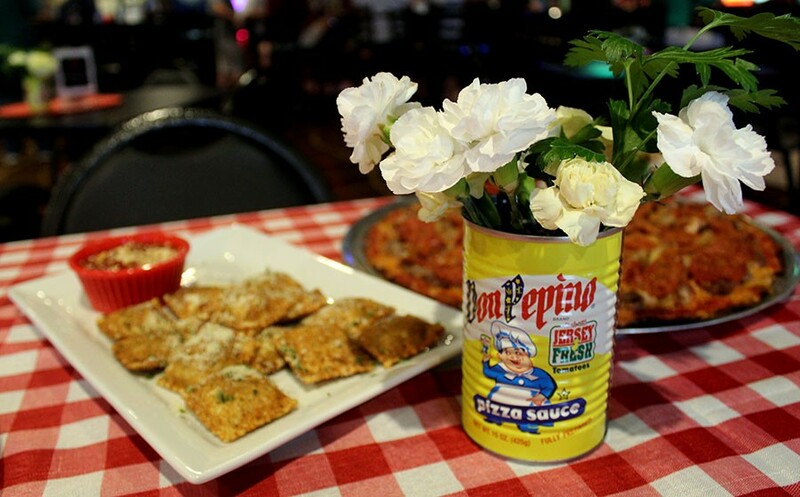 Now their son Tim and his wife, Amy, have brought the family pizza joint back, with a restaurant in St. Peters that honors its traditional recipes. Back in the day, DeRienzo's was one of a few St. Louis-style pizza restaurants in the city. 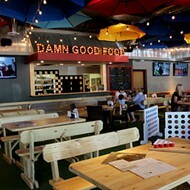 Its popularity led to an expansion to south county, and the family business became a staple in the local pizza scene for almost 30 years. After "Big Joe" died, the family decided to close the restaurants. 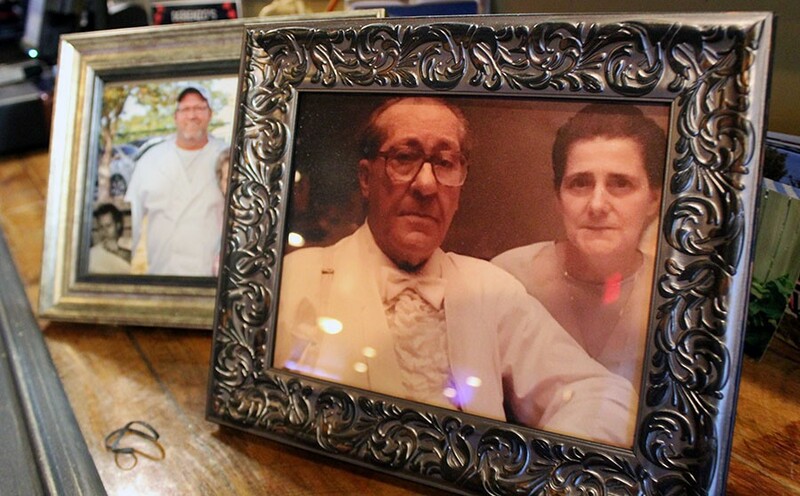 But last year, after Tim DeRienzo retired, he decided it was time to bring back his parents' famous recipes and give St. Charles County a killer pizza-and-sandwich restaurant. "They're why I work so hard at this," Tim DeRienzo explains. "It's not just pizza, it's the hard work they put into it." After renting the kitchen at the Jungerman Road space from a previous bar owner for a year, the DeRienzos bought the space in March and now are in full control. 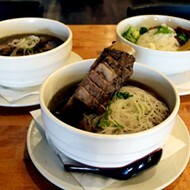 The restaurant is serving up classic appetizers, salads, sandwiches and classic St. Louis thin-crust, Provel-covered pizza. 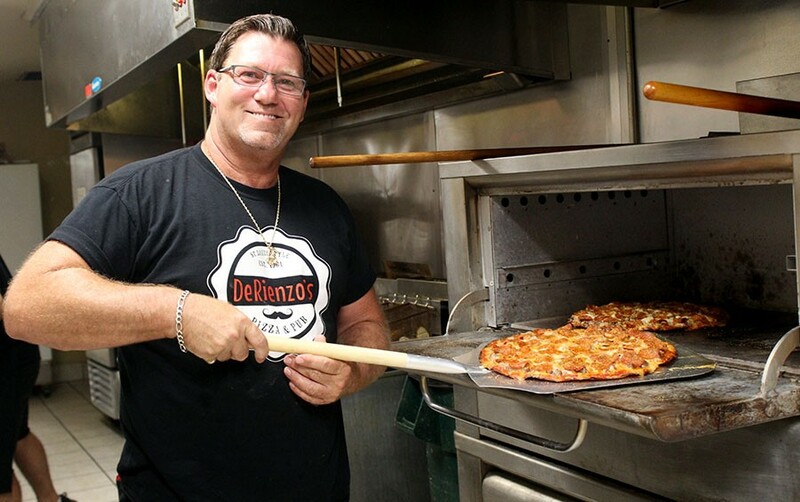 DeRienzo is committed to giving his patrons the best ingredients in town. He gets Fazio bread, meats from the Hill and imported Parmesan cheese. "It's worth every penny," he says. And they're not the only ones saying that. 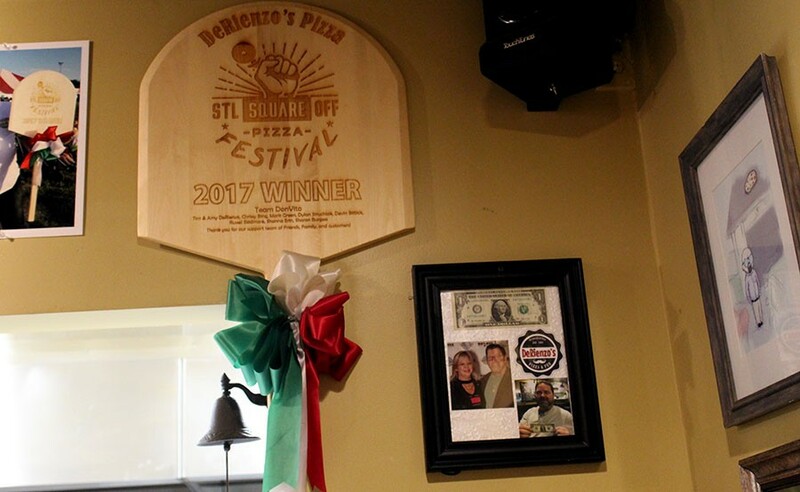 Last year, DeRienzo's won the first-ever St. Louis Square Off, which pitted eight pizza-makers against each other in a competition to determine the best St. Louis-style pizza in town. It was, DeRienzo says, a huge surprise, but one the family is very proud of. The winning pizza is the "Don Vito," topped with sausage, hamburger, bacon and pepperoni and just like the elder DeRienzos used to make. 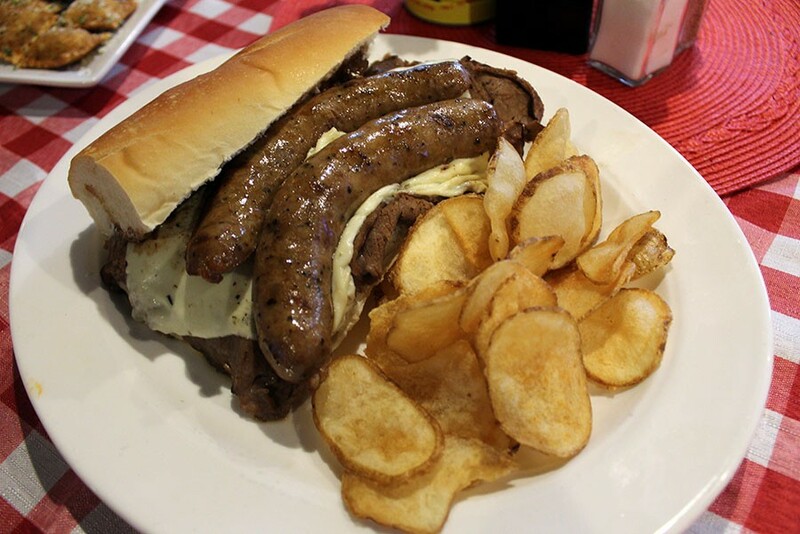 Other hits at DeRienzo's include the Chicago sandwich ($10), which is Fazio bread filled with Italian sausage, house-made roast beef, pepper and Provel. 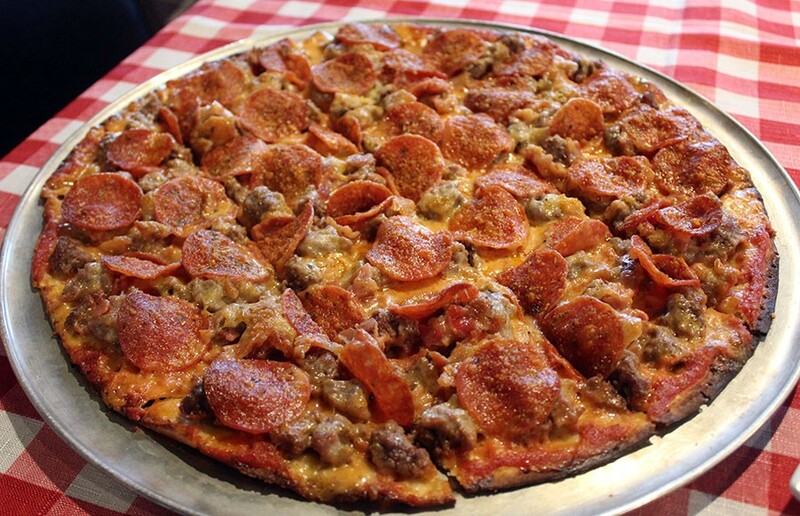 The most popular pizza is the seven-topping Big Joe's Deluxe ($21), which is stacked high with sausage, hamburger, pepperoni, bacon, onion, green pepper and mushroom. Unique Italian favorites from back in the day include the "Original DeRienzo's Burger," a burger topped with Provel, marinara sauce and parm. "Tim's Taste of The Hill Gabagool" is also popular: Volpi salami, Volpi Capocolla, and roast beef with Provel, lettuce, tomato and red onion on top. 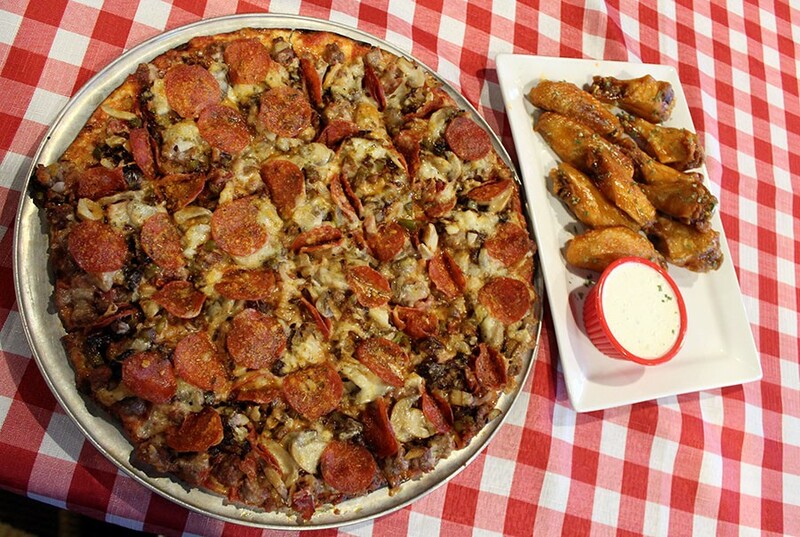 The Big Joe's Deluxe and classic hot wings. Tim DeRienzo hopes to expand within the next year, dreaming of possibly a small carry-out store in another location as well as an expansion of his current space. 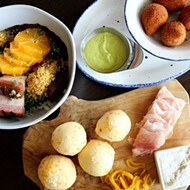 He also plans to expand the menu eventually to include pasta dishes. "It's been one hell of a ride and we're not done yet," he says. DeRienzo's is open Sunday through Tuesday 11 a.m. to midnight and Wednesday through Saturday from 11 a.m. to 1:30 a.m. The kitchen closes between 10 and 11 every night. Tim's parents, the ones who started it all. The Chicago sandwich served with homemade kettle chips. Toasted ravs are a popular appetizer and cost $7. Editor's note: A previous version of this story gave the wrong first name for Tim DeRienzo's mom. She is Ada, not Edna. We also included incorrect information about the source of DeRienzo's pepperoni. We regret the errors.